Geni.com is all about collaborative genealogy — working with others to make the best family tree in the world. A great way to start finding new relatives is by working on a surname page. First of all, go to the surname search page, and enter the surname you’d like to work on. Once you’ve found the Surname page you searched for, you can start viewing the information, and manipulating it. As you can see in the screenshot above, you have the ability to edit the “About” section of the surname. A complete history of the edits is also available. Down to the right, you’ll be able to see every profile that has this particular surname. When you look farther down the page, you’ll also see the projects featuring profiles with this surname. 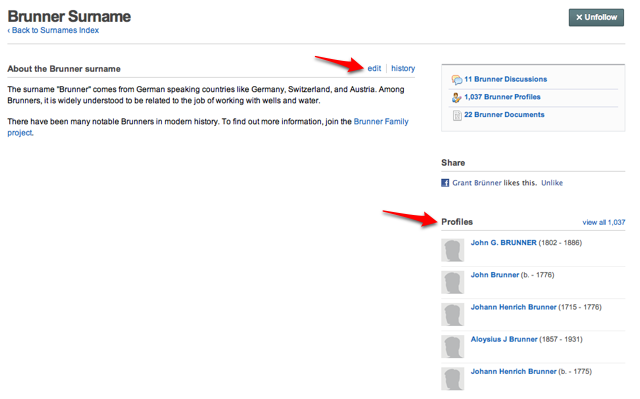 The surname pages are a great resource for collaboration, and we think you’ll love using them.